"distinguished inventors of marvelous machines in the line of steam and electricity." Beginning in the mid-1870s and continuing for over 40 years, the Reades produced a strikingly wide variety of inventions, from helicopter airships to carriage-pulling robots. These devices were constructed in their massive machine shops and foundries in Readestown, Pennsylvania. At one point in 1893 (the same year Archibald Campion unveiled his mechanical man, Boilerplate) the Reades had nearly 1000 people employed in the construction of their experimental vehicles. 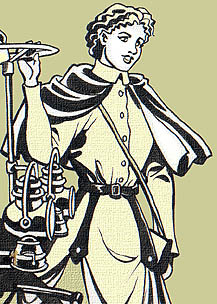 Reade inventions included electric locomotives, one-person battery-powered electric flying suits, "electric cannons" (pneumatic machine guns), an early version of the instant camera, motorcycle-like bicycle cars, armed and armored all-terrain omnibuses, chariot-like "electric phaetons," and ships that could also travel under the water. 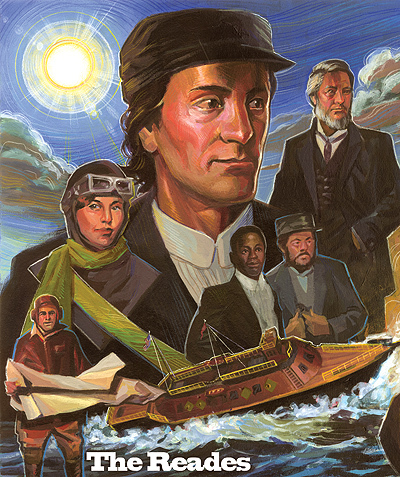 Pictured within the masthead, from left to right: Kate Reade and the Steam Horse; Frank Reade Jr., wearing his ubiquitous nautical cap; Frank Reade Sr. and Jr. with the Steam Man Mark II. 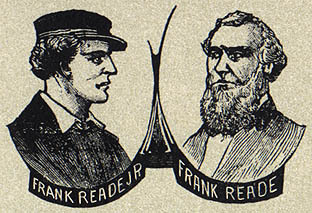 The Frank Reade Library was an attempt to meet the demand for information about the Reade clan's exploits and inventions. Although never officially endorsed by the Reade estate, the magazines' exaggerated accounts of the family’s adventures were actually based on their own records and log books. For publishers such as Tousey, the practice of fancifully extrapolating the exploits of famous figures was a time-honored tradition. Other legends of the age, from Wyatt Earp and Buffalo Bill to Tom Edison and Teddy Roosevelt, were also given incredible embellishments in their own magazinesreferred to at the time as "dime novels." 1840 Frank Reade is born. 1862 Frank Reade Jr. is born. 1868 John Brainerd builds the Steam Man. 1875 Frank Reade meets Pompei DuSable and Barney O’Shea. Barney and Pomp aid the family up through World War I. 1876 Frank Reade, at 36, builds Steam Man Mark II. 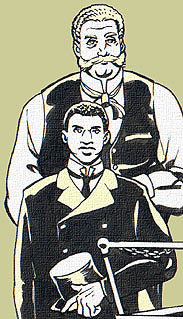 1879 Frank Reade Jr., at 18, builds Steam Man Mark III. Luis Senarens begins his chronicle of the family. 1882 Frank Reade III is born. 1883 Kate Reade is born. 1883 Frank Reade Jr. builds his first electric helicopter airship. 1885 Frank Reade Jr., constructs the Electric Man. 1893 Archibald Campion builds Boilerplate . 1912 Frank Reade Sr. and wife, Mary, die when Titanic sinks. Frank Reade III attends Archibald Campion’s 50th birthday. 1917 Frank Reade III is killed in WWI. 1932 Frank Reade Jr. dies at 71. 1937 Kate Reade disappears in one of her helicopter airships over the South Pacific Ocean. 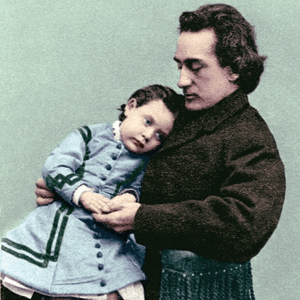 Baby Kate Reade with father Frank Jr. Mechanical experts and invaluable assistants to the Reades. Senarens described DuSable as "one of the finest horsemen living." Luis was a Cuban-American living in Brooklyn. At the age of 14, he paid his own way to Readestown, Pennsylvania, to witness the first public test of the Steam Man Mark III. While there, he convinced the Reades to allow him to write their biographies. New York publisher Frank Tousey (who already had a publishing deal with the Reades) was skeptical about Senarens' age, but because previous accounts of the Reades' adventures had seen print under the byline of "Noname," Tousey knew Senarens could be replaced if nessesary. His worries proved groundless, and Senarens went on to pen hundreds of Frank Reade accounts. While recording the exploits of the Reade family, Luis Senarens also wrote under 27 pseudonyms, writing an estimated 500 novels in his lifetime. One year after Luis Senarens' story of the Steam Man Mark III, Jules Verne wrote "The Steam House" (1880). Years later, the exploits of Frank Reade Jr.'s heilicopter airships (begining in 1883) may have inspired Verne to write the novel "Robur the Conquerer" (1886)--about a sort of airborne Captain Nemo, traveling the skies in a helicopter airship. All contents copyright 2002, 2012 Paul Guinan.